Ready for another mixed media project ? How about a quick and fun one ? It’s summer, we all have some books to catch up with, so what about bookmarks ? Choose your favorite stamps, AA stencils and few AA mediums and have fun ! I choose the Patience Colorations spray and the Azalea pink new Shine for the base of the bookmarks. I then use the new Messy Bubbles stencil with Mardi Gras Velvet before adding white lines on the edges. After stamping the flowers, I colored them with Canary Yellow Shine, Sunrise Orange Shine and Kelly Green Shine before cutting them out. Next and final step was to add a stamped quote. Thank you for stopping by today, I hope to see you very soon on this blog for another project… Have a great day ! This entry was posted in Colorations, Design Team, Mixed Media, Projects, Shine, Stencil, Valerie Andrieux and tagged Colorations Spray, mixed media, scrapbooking, Shine, stencil, Tags, video tutorials on July 5, 2018 by Valerie Andrieux. HI Friends, Its Karan here to share a project with you today. In the past i have shared with you a Dream Catcher and today i have another one i wish to share with you too. I have to apologise, but i so love this color combo. Peacock feathers, Grass and Amber. This particular Dream Catcher i have designed on a thick tag. and the entire Dream Catcher on the Tag! Check out How to Create a Dream Catcher With Karan by Art Anthology on Snapguide. Other Products: Tim Holtz Ectera Tag; Creative Embellishments Chipboard; Scrapiniec Chipboard. This entry was posted in altered items, Clear Coats, Design Team, Home Decor, Karan Gerber, Mixed Media, Patina Texture Set and tagged altered art, art anthology, Colorations, Colorations Spray, Home Decor, mixed media, sorbets, Tags on June 10, 2018 by DesignTeam. Check out How to Create These Mixed Media Tags With Daniëlle by Art Anthology on Snapguide. 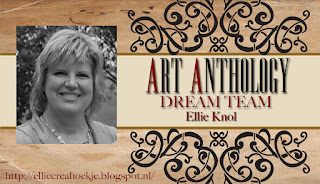 If you are looking for more inspiration check out Art Anthology on Pinterest and YouTube. You can also join our Facebook group Art Anthology’s Adventures in Art, where you can share your creations! This entry was posted in Daniëlle Noorman, Design Team, Gemstones, Metal-Effects, Minx Shimmering Inks, Mixed Media, Sorbet, Stencil, Uncategorized, Velvet and tagged Daniëlle Noorman, Gemstones, Metal-Effects, Minx Shimmering Inks, sorbet, stencil, Tags, velvet on January 19, 2018 by Danielle Noorman. Hello there, it’s Valerie ! The chevron pattern came from the Chevron stencil used with Lagoon Velvet medium. I just added few stamps and washi tapes to complete the design. I obtain the background by spraying Siesta Key and Peacock Feathers. I added the washi tapes before stenciling, and then Stamped in black ink. The Gold Metal Effects higlight some of the stamped patterns. I also sprayed some Gilded Gold Fairy Dust to add some shine to the project. This entry was posted in Cards, Colorations, Design Team, Fairy Dust, Metal-Effects, Mixed Media, Projects, Stencil, Valerie Andrieux, Velvet and tagged art anthology, bookmark, cards, Colorations, Colorations Spray, Design Team, Metal-Effects, mixed media, scrapbooking, stencil, stencils, Tags, Tutorial, velvet, video, video tutorials on November 9, 2017 by Valerie Andrieux. Hello there, here is my next DT project for Art Anthology. I made some colorful purple and yellow tags, using some black for contrast. These are colorful and simple to create using Art Anthology’s Colorations spray, somewhat mixed in with Minx ink. For added texture I used some Stone Effects through the stencil and Sorbet medium on the chipboard. For a tad more texture I also applied some purple and black glass glitter. Hope you are feeling inspired to create your own…below you will find a step by step tutorial. Check out How to Make Some Colorful Tags. by Art Anthology on Snapguide. This entry was posted in AA Effects, Colorations, Minx Shimmering Inks, Mixed Media, Sorbet, Stencil, Stone Effects and tagged Tags on July 22, 2017 by DesignTeam. Hi fans! I’m here to show you some tags I made featuring two handmade paperclay fairies. I used some dimensional paints and the Retro Stencil for the background of my tags. Then I used some colorations sprays with a tiny paintbrush to color the fairies! A super coat of Guilded Gold Fairy Dust Spray over them finished them perfectly. Check out How to Make Some Fun Fairy Tags by Art Anthology on Snapguide. Come say hello and show off your Art Anthology creations on our Facebook page! Art Anthology- Adventues in Art! We’d love to see you!!! Here’s a list of the Art Anthology products I used! This entry was posted in Brandy Johnson, Colorations, Design Team, Gesso, Mixed Media, Sorbet, Stencil, Velvet and tagged Tags on June 3, 2017 by DesignTeam. Marleen here with a little inspiration for you! Check out How to Make These Messy Tags. by Art Anthology on Snapguide. where you can share your creations! Shop at the Art Anthology’s online store. This entry was posted in Colorations, Gesso, Marleen van Meerendonk, Sorbet, Stencil, Velvet and tagged art anthology, Colorations, Marleen van Meerendonk, sorbet, stencils, Tags, Tutorial, velvet on May 29, 2017 by Marleen van Meerendonk. Making this project took me over a week… trial and error… starting, not being satisfied, and changing details all the time.. it was a bit frustrating, but I am happy with it now. I started with a tiny blue t-shirt, with text on it that I wanted covered. I was happy with the outcome of the shirt straight away.. just added some white highlights later on. But the base… grrrr… If you look at the step-by-step in the Snapguide tutorial, you’ll see what I mean. I like this detail in the background! …hope this little newborn boy will see it later on in his life and be happy with it! His mommy will, anyway! Check out How to Create a Wall Hanger for a Newborn Baby by Art Anthology on Snapguide. I hope that I have inspired you to think out of the box.. and keep trying when it doesn’t turn out as you imagined it. our Facebook group Art Anthology’s Adventures in Art ! You can share your creations there, too! This entry was posted in collage, Design Team, Ellie Knol, Home Decor, Mixed Media, Sorbet, Stencil, Stone Effects and tagged art anthology, Ellie Knol, Home Decor, mixed media, sorbet dimensional paints, Stone Effects, Tags, Tutorial on May 17, 2017 by DesignTeam.